Stitches West meetup! We'll be in the Purlescence booths (640 & 740) on Saturday, February 28th from 2-4 PM. The goodie bags are awesome. We will be holding back 1 goodie bag (out of 100) and doing a contest for those who couldn't make it to the meetup. We will be including a pin in the goodie bag. Going forward, a donation of $10 or more will get you some of our permission slips/business cards AND a Knitmore Girls logo pin. Gigi has (sort of) finished an UFO. The Ribbon Twist sweater needs seaming and blocking, but the knitting is done. Jasmin finished her Twist! In a couple of episodes, we'll post a video in the show notes on how to attach buttons using Gigi's couture technique. Jasmin used the Malabrigo sock yarn (in "Lettuce") to set in the sleeves, since it is a stronger yarn. Jasmin pulled an 8-year-old UFO out of her stash. She is working on finishing the ex-boyfriend sweater. She will be reworking the cowl from a "cheater" cowl to a true, short-rowed cowl collar. Jasmin will be blocking her Santa Fe Wrap, which she will be wearing to Stitches. Gigi continues to work on her Bulky boot socks and her Scandanavian pattern socks (from the ubiquitous Little Box of Socks ), and finds Fair Isle addictive. Jasmin and Gigi talk about Ravelry, queues, and tagging. We also talk about using leftover sock yarn to knit the Fish hats from Knitty. Jasmin and Gigi talk about their favorite handpainters (Tess Yarns, Lisa Souza Dyeworks, Ellen's Half-Pint Farm), and style aesthetics versus knitting aesthetics. Jasmin talks about purging old knit socks; Gigi talks about storage for knit socks. Jasmin has cast on a pair of Ellen's Half-Pint farm 50% Superwash Merino/50% Tencel socks in greens. 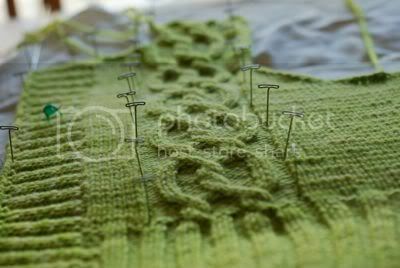 Gigi continues to work on her On the Vine scarf. - Review your purchases. If you go for more than one day, spread out your purchases and take a good look. Make sure you've got the right quantities, everything from your wishlist, etc. Jasmin can't count to 3. Gigi was assaulted by patterns at the fabric store. Whinning a little no LYS but I always have the internet Yah! No fiber festivals like Stitches where you can actually see and feel the new yarns!!! OK I willl stop whinning now! I love you guys, your shows are always so informative and fun! Darlene in PEI where we are on our second day in a row of storms ...lots of knitting though!!! I discovered your podcast and LOVE it!!!!! You are so informative and give great information out. I figured out how to get you on my feed or is it called rss. Anyways this is exciting to meet you guys. Love the links. Great if you did a show on knitting in the round. I try to make my garments in the round only. No sewing. I am also working on a Tomtem jacket. By Zimmerman. That is fun also. Also another great podcaster is Knitpicks with Kelly Pectan. She is awesome and informative like you guys. 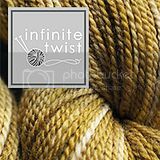 I love your review on knitting products and yarns. You guys are such a cute team and blessed you get along so well to present a super show.